Image © TheObjectReport.com | Reposting is allowed so long as a link to the original source is provided. Note: image above is a computer generated composite used to help illustrate the content of the article. Our friend Roger Marsh over at The Examiner has done a wonderful job of collecting recent eyewitness reports of these craft from MUFON and NUFORC among other sources, a few of which I’ll discuss in a moment. A quick search of the MUFON sightings database sorting by ‘shape’ (triangle) and ‘color’ (black) yields 50 reports just in the past two months alone. Looking at the NUFORC sightings database I chose July–being the month with the highest number of reports for the year at 905–and personally counted 106 ‘silent black triangle’ reports. That’s a pretty dramatic percentage when you really think about it, basically one out of every 9 ufo sightings is of a silent black triangle. From 1981-1985, a wave of huge black triangular craft sightings swept through theHudson River Valley. It is perhaps one of the best cases on record with over 7,000 eyewitness reports, many of whom were aerospace engineers, cops, executives, scientists, and other qualified observers. During the Belgian wave of black triangle sightings from 1989-1990 there were over 5,000 reported UFO sightings, and of that 5,000 over 2,000 were specifically of black triangular craft. Major increase in sightings near cities, not just rural areas. It’s 2012, and judging by the number of eyewitness accounts in the past two months alone, it looks to me like we’re in the midst of another wave of black triangle and giant boomerang sightings. Let’s take a closer look at some of the more recent reports. 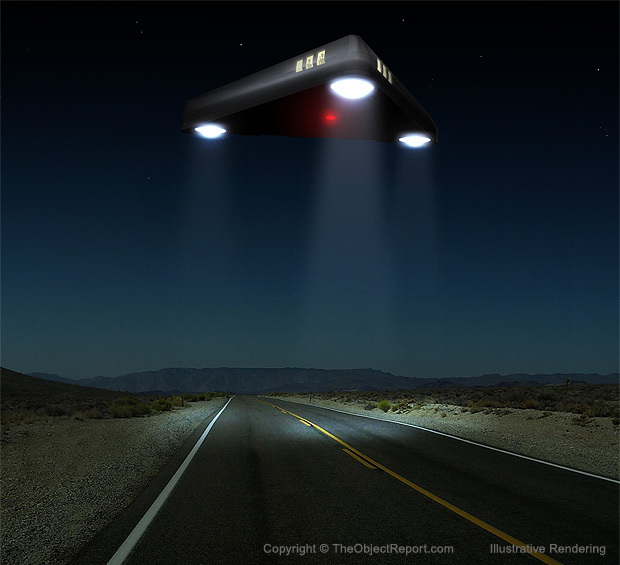 December 4, 2012, 7:30 pm, Germantown, MD – Large triangular shaped object large red lights on each point. Case 44324. I was driving in my car going home on Warfield Road between Germantown and Olney just by rt 124. I noticed just over the tree line a slow large moving object. It had very bright white and green lights. It appeared the width of the craft was coming toward me. Id say the lights were about 100 or more feet wide with the green lights interspersed. I stopped my car and watched the object fly over me. It had 3 large circular red lights on the bottom about twice the size of a pitching mound. Each of three lights had a very ornate metal structure covering themwhich was easy to see the details on the bottom. The red lights werent glowing at all on the bottom. It seemed like a very heavy object yet it flew over me without a sound, without wind or turbulence of any kind. You could just make out the triangular shape given my vantage point, it was a very dark evening. What impressed me most are the red circles on the bottom. These circles did protrude, kind of like a contact lense but not so extreme. “(That early morning of September 2, 2012, at 3:52 AM,) the next door neighbor’s dog started barking and it was a different bark – almost an intimidated bark. It kind of alarmed me. I turned on the outside lights and looked down the driveway. I didn’t see anything, so I turned off the outside lights and went around to the front door and walked out onto the porch. I could see the next door neighbor’s driveway and his garage through the trees. And I heard my neighbor tell the dog to be quiet. Normally, he’ll quiet right down, but this time he still made a growl and a woof and did not quiet down. So I thought that quite strange. Then through the trees right across the street over my neighbor’s house came this orange glow. And then in just a flash, it became quite bright and started to move from south to north directly over my neighbor’s house. It came into a clearing in the trees approximately 200 feet off the ground. I would estimate the size of the equilateral triangle craft was about 100 feet corner to corner. It consisted of seven equal-sized, bright, red-orange globes, like a glass ball with a bright orange flame inside – not moving around – just this constant orange color. The six outer globes that made up the edges of the triangular craft were each encapsulated in a “cage” similar to what you would see in the stitching of a soccer ball’s hexagonal shapes. Then in the center was one of the orange globes that did not have any type of cage around it at all. You can read the rest of this fascinating eyewitness account on Linda Moulton-Howe’s website, Earthfiles. I just wanted to point out the fact that this craft had a metallic, mechanical element to the underside of it just like the witness from Maryland described. I think this is an interesting and important correlation to keep in mind. I was in my car headed west on I-10 and i was just looking around and i saw some lights in a triangle formation and one beam of light that appeared to scan the area, as it got closer it appeared to be a solid triangular craft about 50 feet across, i saw two more of these craft within 5 mins. approximately 2 mins later i saw a fourth triangular craft about 1/4 mile in size with lights on all corners and a light scanning the area turning sharply, after it went out of view i grabbed a notebook and wrote down the dimensions of each craft, location, and time the event occurred. Oh boy, either the military keeps losing something and sending out massive black triangular craft to search for whatever it is, or these aren’t military craft at all. I feel this witness may have a little trouble judging lengths and distances because one craft 50 feet in diameter next to a second craft that’s a “quarter mile” in diameter would look like a helicopter next to Mount Rushmore, nothing like their drawing. Again, I think in the excitement and adrenaline rush of the moment people tend to have exaggerated perceptions when it comes to size, distance and even time. But the point to make about this particular sighting is the fact that it was near I-10 which is a heavily trafficked major highway. I was on my way to work on November 30, 2012 at 4:25 am. As I turned the corner down the road a huge black triangle object flying low, maybe twice tree top level came over my street moving north east. The object was moving very slow and as it crossed over the street and my car it stopped just above the house on the east side of the street and hovered. The object was black, darker than the night sky with the exception of three very bright pulsating lights at each corner and a large bright center light. The lights changed colors but did not appear to have any pattern to the movement. The object was absolutely huge. It easily covered the entire house and then some. I rolled my window down to take a picture and video with my cell phone but could not get it to come on. So I quickly made a sketch of what I was seeing on a receipt that I had in my car. The object started to move slowly and when I went to try and get my cell phone to work again and I looked up and the object was gone. There was no engine noise what so ever and it was just gone. Interesting detail to note with this case is that the lighting pattern differs from other eyewitness testimony. The three corner lights were pulsating and changing colors instead of maintaining the typical steady, unblinking bluish-white glow. This brings us back to a point I made in my previous article which is why would these lighting patterns be so over the top with shifting colors and “stadium lights” as some witnesses have described them? It makes no logical sense and goes against everything the military goes out of their way to avoid. Speaking of non-FAA regulation lighting, take a look at this report from October 10th, 2012 – 1:43 am, Davis, CA: “(GS) Investigating a sound, went outside and saw triangle craft slowly pass overhead. It hovered on the horizon.” Luckily for us, this eyewitness managed to grab some video which–although not crystal clear–is still quite good because it depicts this insane navigational lighting pattern. Click here to see the MP4 video. Finally, reports such as the next one are what really give credence to this entire phenomenon. On January 15th, 1993 a Texas State Trooper, two truckers and another female bystander witnessed up close and personal a massive black triangle near a highway. The level of detail given in this report by a trained observer is nothing short of excellent. It was triangular in shape, massive in size and eerily quiet. I was a State Trooper working the night shift and was patrolling US83 south of Canadian, TX. It was around 10:30PM local time. I always had a citizens band radio on and had been listening to two truck drivers enjoying a conversation. It was an unusually warm evening for a winter night and I was wearing short sleeves and had the car window cracked a bit as I slowly patrolled northbound. As this is the Texas panhandle area, the land is fairly flat, but with some rolling hills every so often. I could see the two trucks ahead of me and all three of us were driving north. The two trucks were approximately 1 – 1.5 miles ahead of me. As we neared the Washita Creek bridge on US83, the road dipped down into a little valley. I lost sight of the trucks as they dipped lower than me. One of the drivers was talking away when he suddenly stopped and said “What the hell is that”? I heard the second driver say “What are you…oh hell!”. The radio was silent for a few seconds and then I heard the second trucker say “I nearly ran into you when you stopped. Are you pulling over?” To which the other trucker said “Hell yes…I want to see it”. By this time I was starting down the incline toward the creek and I could see one truck stopped and on the side of the road and the other pulling past it to park in front of it. I still didn’t know what they were talking about but started slowing down. I crossed the bridge and at that point I saw the driver of the truck just in front of me standing in the middle of US83. He was looking west and upward. This was the first time that I realized a very bright light was shining onto the ground from what appeared to be a very large dark object which seemed to be about 1,000 feet in the air and maybe a mile and a half away. I remember thinking this because I’d been down the dirt road that runs from this location west and was fairly familiar with the topography here…and I could make out it was over another hill. I was afraid I’d be run over from behind so I started to park my patrol car on the shoulder beside the first truck. I could see the second driver running to the first one and pointing at the object. At this point, a small passenger car topped the hill just north of us and started slowing down…probably from seeing the two trucks and my car parked there. But as the car passed by I saw the brake lights come on and the car slightly screeched to a stop right in the middle of the south-bound lane. There was a female driver and she stepped out of her car, right foot still inside but standing outside the car, and was looking at the object. I asked her to quickly move out of the road. She turned to me and said “What is that?” I told her I didn’t know, but to please move. She did so quickly and then came back to us. Now there were the two truckers, the lady and myself standing on the shoulder of the southbound lane. I couldn’t hear a sound from the craft but could see a immensely bright beam of light shining straight down. The light didn’t sway back and forth like a search light or anything…it just shone straight down. Suddenly I was aware of the fact that the object appeared to be moving toward us very slowly. This was because I realized the sheer dimensions of the craft. There was absolutely no sound coming from the craft. Not even a whisper. I realized no one was talking…I think we were completely confounded by what we were seeing. After around five minutes, the object had gotten to a point that I felt it was within a mile of us. I still had the strong sensation that it was higher above us than it appeared. That’s when the bright light simply shut off and it was easier to see the outline of the craft. The mere size of the craft was incredible. If my references are even near what I think they are, I’d estimate the size of the craft to be at least 1000′ per side. It was massive. The reason I use this word is two fold. One is from the dimensions of it. But the other is this. As the craft neared being almost directly over us, I remember feeling weight….felt something heavy on me. It also seemed as if there was a haze around the object…just barely off of the surface that seemed to make the stars near the edge flicker before they were occulted by the object itself. I also remember realizing I was holding my breath. And although we couldn’t hear anything, one of the truckers said, “Do y’all feel that?” It felt as though everything, the road, the air, us…everything seemed to be vibrating. Up to this point, I don’t think what I felt was fear….just amazement. But when the craft was directly over us, something happened. I was staring straight up at it, and I remember at this point that the women started sobbing and ran away to her car. She left before I ever said another word to her. The object was black. Much blacker than the sky. This may have been an illusion from all the stars in the background, but it was darker to me. But as I looked up, I suddenly saw a circle appear…just forward of what would be the center of the object. This circle didn’t light up. It became darker…as if there was absolutely no light shining from it or reflected from it. Without a doubt it was darker than the rest of the craft. The craft literally stopped directly above us. One of the drivers asked me if I should call for help. I told him I didn’t know what I’d say. The thought did cross my mind, but I was thinking they’d be thinking I was crazy back at the Sheriff’s Office. The craft then started pivoting above us…with the point moving clockwise in relation to me until it was pointed in a generally north-west direction. Then it began moving again. I remember hearing one of the truckers talking, but my ears felt as if they were going to pop. Again, there wasn’t a sound from it…but a tremendous feeling of weight or pressure…sort of like when you dive deeply into the water. That kind of feeling. As the craft moved off slowly, one of the drivers said something about driving to the top of the next hill to see it more clearly. He started to turn away and at that moment the craft sped up noticeably, then shot off to the northwest in a matter of 3-4 seconds. The drivers asked me what we should do and I told them I didn’t know. I don’t know what we saw, what we experienced. One of the drivers, the one that said he wanted to see it from the hilltop, ran to his truck and drove north. I ran to my patrol car and got in, passed him on the way north and pulled over at the top of the rise. We all got out again but couldn’t see anything. I remember my ears were ringing like mad. Looking back, I think this was side effects of an adrenaline rush. I’ve been in shootings, high-speed pursuits and numerous other tension-filled moments and I always have that reaction. then sat down at my desk in the study and sketched out the craft on a piece of paper. I then went into my bedroom where my wife was asleep. As I lay down, she rolled over to kiss me goodnight but stopped and asked “Have you been fighting a grass fire or something?” I said no and asked why. She told me I smelled like burned grass or hair. I told her what I’d seen just an hour earlier. She knew I was sincere. The next morning, I got out of bed and walked into the bathroom. As I looked in the mirror, I saw that my face looked like I had a very light sunburn. Not deep red…just a little blushed. I looked down and most of the hair on both arms looked as if I’d been synged with a flame. I called my wife and she came in and gasped at how I looked. We looked in the bed and there was a mass of burned hair on my pillow and the sheets. I say burned…I mean it was very brittle and it and I still smelled like I’d been fighting a fire. That was 12 years ago. I still see it in my mind and I sometimes dream about it. I’ve never told anyone other than my dearest and most trusted friends. I have no doubt that what I saw was real. I have no doubt that it was huge, it was manned, and it was being intelligently operated. I’m not assuming anything…that it was an alien craft, a military craft or whatever. But what I saw moved with great stealth when I first saw it and was able to reach an unbelievably high speed in the blink of an eye. So…as you’re reading this, you may think I’m nuts. But this is the single-most bizarre thing I’ve ever experienced, and I’m absolutely convinced it was real. NUFORC Note: Witness indicates that date of sighting is approximate. We have responded to the report, and hope to be able to communicate with the witness in greater detail about the incident. PD. Different configurations, different sizes, different lighting patterns. Are we seeing completely different craft? The military decided that just ONE type of enormous, silent black triangular craft with a bizarre lighting pattern wasn’t enough for their needs, so they had 4 or 5 other aerospace manufacturers build 5 or 6 different type of triangular craft to carry out roughly the same mission. Some of these craft are prototypes or proof-of-concept vehicles which are being flight tested in advance of building the final production variant. There are dozens of these craft based out of dozens of different Air Force bases throughout the country, and not a single person within the military has ever leaked even the smallest bit of information about them in decades? No flight line mechanic has ever told his wife or girlfriend that he changed a tire on a black triangle the size of a football field? No airbase ATC controller has ever mentioned to a friend in a bar that he or she was part of the engineering team on a craft that made the Space Shuttle look like a Cessna? No Air Force pilot has EVER discussed their involvement in such a program with anyone, family or otherwise. I find this terribly difficult to believe. Sightings of these craft began in the early 1980’s and have continued with more or less visibility for the past 30+ years. Thirty years. I’m not buying it, and anyone with half an analytical mind isn’t buying it either. Yes, the military is widely known to operate black budget craft in secrecy until such time as they need to start operating in the open. This was true of the SR-71 Blackbird, the F-117 Nighthawk and the B-2 Spirit. More recently the public became aware of a stealth variant of the Blackhawk helicopter which crashed during the raid on Osama Bin Laden. That was quite a nice surprise because it came totally out of left field, nobody expected it. But when you really think about it, it makes total sense that there would be a stealth helo in the military arsenal. The RAH-66 Comanche laid the ground work and when that program was cancelled do you really think any of that technology went to waste? Certainly not. But a helicopter is easy to hide. It easily fits in the belly of a C-5 or C-17 and can be operated under the cover of darkness. It’s much, much harder to hide a black triangle the size of a C-5! Maybe they’re ours, maybe they’re not. Either way, we should care. If they’re ours, then they are more likely the type of craft described by Dennis Bossack in my previous article on this topic. I may be going out on a limb to say they’re not of this earth, but the facts simply don’t stack up here. This phenomenon is being witnessed by people across the country in both rural and, more recently, heavily populated areas. The last thing you want to do with a top secret piece of military hardware is draw attention to it with stadium spotlights searching the ground, multi-colored strobe lights, and in some cases even brightly lit windows. It makes zero logical sense. If the military wished to roll out a top secret new aircraft to the public, they would do so with the obligatory ceremony commemorating a new era of advanced technology celebrating the men and women who made it all possible. They did it for the B-2 in 1988, the U-2 and the SR-71 in the 60’s. If there’s one thing military brass loves, it’s getting positive public attention for all the taxpayer dollars that went toward development. Where’s the roll out of the giant black triangle and the statement that “The public will be seeing more of these in the skies and we don’t want you to be alarmed…” ?? These craft operate with total disregard as to who sees them or whether or not they’re being photographed or recorded by eyewitnesses on the ground. They follow no rational pattern of behavior, sometimes they’ll hover above a random house, street, movie theater or field with no rhyme or reason as to their mission or intentions. In more and more cases, these seem to appear less like military craft and more like somethingelse. Could this be a precursor to full disclosure? Perhaps. Could we be seeing the first cracks forming in the crust of secrecy that has surrounded this subject for nearly 70 years? Maybe… Either way, we’ll continue to research this topic and hopefully uncover more information about this phenomenon in the process. If you have experiences of your own to share, please feel free to contact us. NextMERRY CHRISTMAS TO ALL AND TO ALL A GOOD NIGHT!